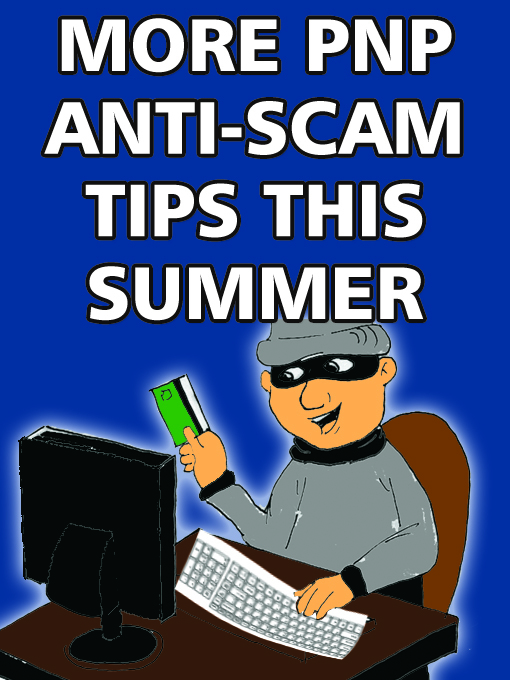 IN a country where texting, browsing the web and engaging in online chats are common day-to-day activities, here are more Philippine National Police tips on how to detect scams and what an individual should do in case he or she encounters one this summer time. According to the PNP leadership headed by Director General Ronald ‘Bato’ M. dela Rosa, the safety tips were designed to prepare and equip the public with the necessary information needed to counter the ever-growing threats posed by scammers including those involved in cyber-terrorism and other online frauds. PNP spokesman, Chief Superintendent Dionardo B. Carlos encouraged the citizenry to thoroughly consider the following safety tips since everybody needs to develop his or her own safety core competency needed to help save precious lives and properties. 2. Always find a way to verify or validate the call or messages. 3. Do not give any information. 4. On unscrupulous text messages, do not waste your load. Let them run out of load. Do not text back. Ignore their messages. 5. Do not give out personal information that can be exploited like your full name, email address, mobile number, place and date of birth most especially your SSS number, credit card number, bank account details, etc. They are fishing for you to tell them of your financial information. 6. If you have given up your formation already, contact your financial institution/bank at once. You likely will have to close your account immediately. Foreign exchange scam — The group/individual approaches and convinces their would-be victim into exchanging their foreign currencies into pesos at a rate higher than the prevailing exchange rates. During the transaction which actually takes place outside or right in front of a foreign exchange shop, the equivalent pesos are counted before the victim three times. Initially, the victim is allowed to count the money he will receive to make him feel confident that he will get the exact amount for his foreign currency. After that, a recount is done by one of the perpetrators who spread the pesos in his palm to cover his fingers that are folding a portion of the bunch. At the same time, the suspect distracts the attention of the victim, often by telling him to be extra careful of robbers while wrapping the bundle of money in a newspaper or placing it inside a paper bag. The victim eventually discovers that he was short-changed when he counts the money while inside a car or upon arrival at his house or hotel. What to do: Avoid foreign exchange trades outside legitimate establishments. Stay away from people transacting or following you that offer tempting deals and report to the nearest authority or police station. The PNP also warned against the presence of local and international syndicates engaged in cyber extortion or more commonly known as ‘sextortion.’ The Interpol recently lauded the PNP for its series of accomplishments against local and international syndicates engaged in all forms of cybercrimes specifically cyber-terrorism. Dozens of suspected ‘sextortionists’ have been arrested by agents of the PNP Anti-Cybercrime Group, three of them accused three years ago of victimizing a teenager from UK who later killed himself after he was threatened by the syndicate they will upload his recorded cybersex act if he will fail to deposit money to their given account. “Be cautious about people you meet online. Revealing personal details online is extremely risky and may not be who they seem to be, because there are lots of fake accounts online,” he said in warning the public in the wake of the series of police anti-sextortion raids. According to Carlos, “scammers often seek soft targets so they move on if you do not respond.” “Just block their e-mails and their accounts and cease all contacts with the scammer. If ever you encounter this kind of scam, save the scammer’s details, e-mails, comment threads, or any other evidence you have of them and the extortion attempt,” he added. The PNP has a strict policy against paying scammers and extortionist. He said that persons being victimized by scammers can contact the PNP-ACG hotline 414-1560 or e-mail complaints at acg.pnp.gov.ph for immediate assistance 24/7. Persons victimized by these con artists may call or go to the nearest police station to file their complaint or dial DILG Patrol 117 or Text PNP 2920. This entry was posted in government, Newpaper, Online protection, Safety tips and tagged anti-scam tips, illustration, Mamang Pulis Tips, online protection on May 5, 2017 by Yami.